Why isn’t my (insert your plant here) blooming? From the search strings that bring people to this blog looking for information, it is possible for me to identify common themes — questions that repeat, often at specific times of the year. To answer those, I’ve decided to add a new category: FAQ, Frequently Asked Questions. This is the first post in that category. Lately, I’ve seen several search strings asking why the writer’s deciduous azaleas aren’t blooming. Today, I’ll answer that question specifically, and I’ll also offer factors you may want to consider the next time something you’ve planted doesn’t bloom as expected. Why isn’t my deciduous azalea blooming? How old is your planting? Most of my deciduous azaleas didn’t begin blooming until the third year after I planted them, because I buy small, less expensive shrubs. Each round azalea flower bud produces a cluster of gorgeous flowers. Is your shrub still alive? Because these shrubs mostly bloom before they leaf out, a casual glance may not answer this question. With your fingernail, gently scrape away a bit of bark along the stem. If you see green, your shrub is alive. This is a great way to test for life signs in any woody plant. Is your shrub sited correctly? 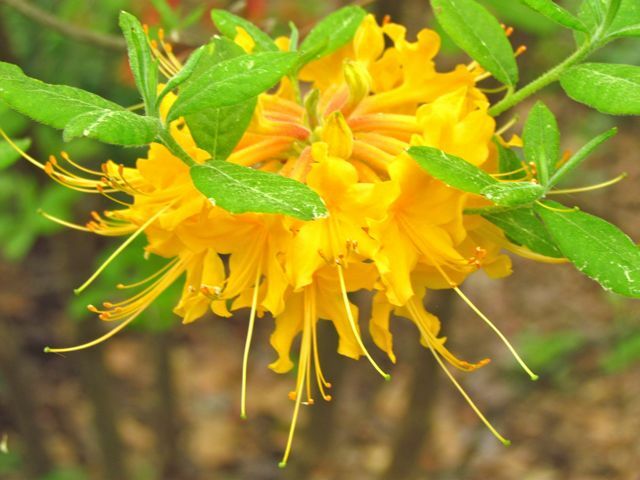 Some deciduous azaleas are native to dry slopes, some to moist slopes, and some to moist bottomlands. If your shrub isn’t sited correctly, blooming will be inhibited. 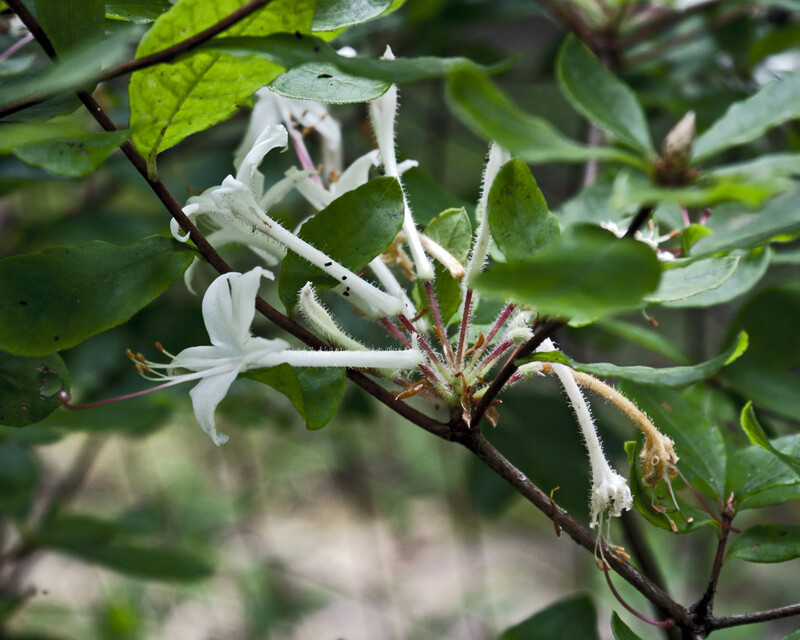 Hammocksweet Azalea craves moisture and blooms in late summer. 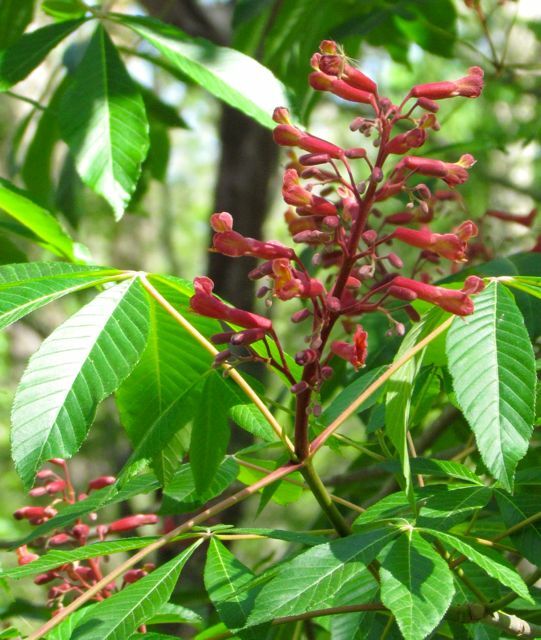 Is your shrub getting enough sunlight during the growing season? The leaves that follow flowering won’t be able to make enough food to create flower buds for the next season if they don’t receive enough sunlight. In my experience, these shrubs need a minimum of four hours of strong sunlight, preferably morning light. Is your shrub receiving enough TLC? Are you watering during droughts? 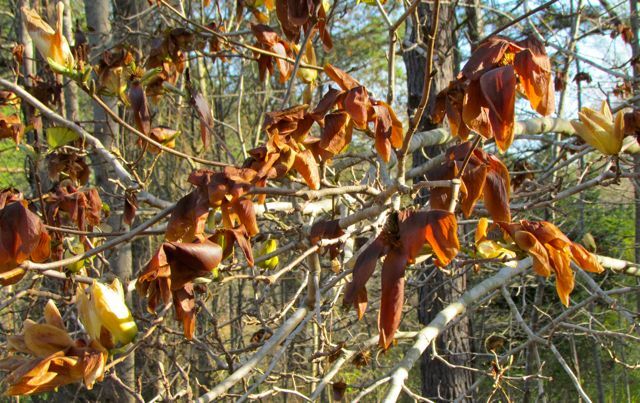 If not, to conserve resources, shrubs will drop flower buds first. Are the roots mulched to keep them cool? Are weeds choking the shrub? Any of these factors stress your shrub and reduce its likelihood of flowering. Did your shrub bloom heavily last year? Some plants alternate heavy blooming years; some even wait several years before blooming heavily again. If yours was gorgeous last year, maybe it’s taking a break this year. Did your yard get hit with a late hard freeze? 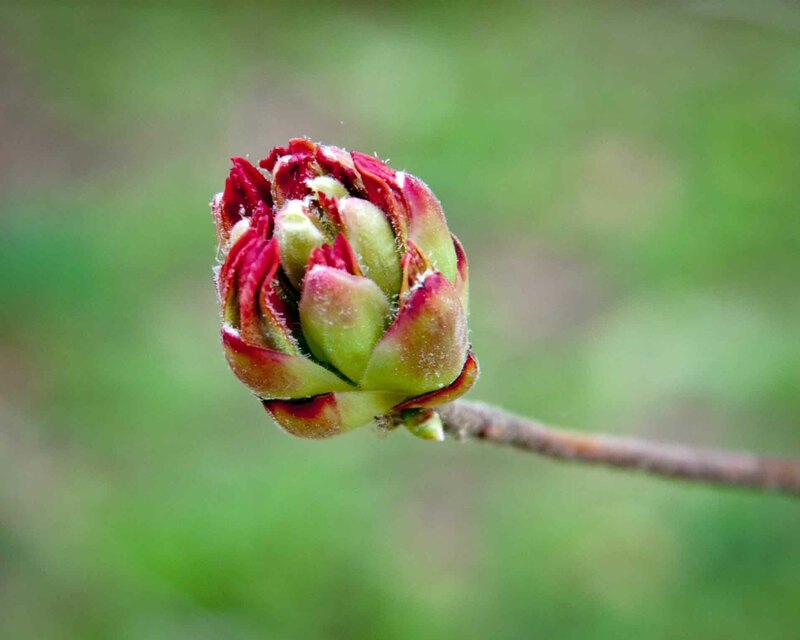 Cold air kills tender flower buds and blooms quite easily. Check your plant for limp, brown buds. Have you checked for deer damage? Flower buds of deciduous azaleas are not favorite deer food, but deer will eat — or at least taste — almost any plant. If you have stems with the buds chomped off, suspect deer. 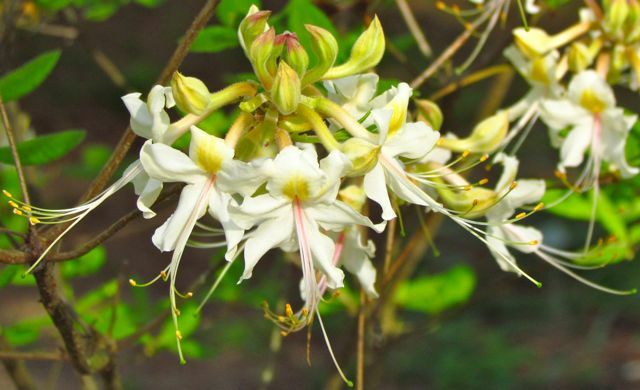 After the leaves drop this fall, spray any flower buds you see with deer repellant, or enclose the area where the azaleas grow with deer fencing to keep the critters away from your beauties. 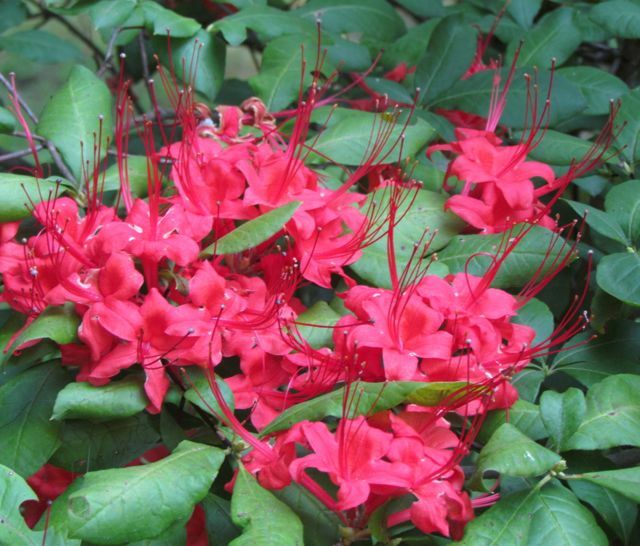 Hummingbirds love mid-summer-blooming Plumleaf Azalea, which blooms after its leaves are already well established. Did you prune your shrub at the wrong time? Deciduous azaleas should never be sheared into shapes the way some folks do to their evergreen Asian azaleas (and they shouldn’t do that either, in my opinion). The natural branching structure of deciduous azaleas is part of their charm. However, if you feel the need to prune a stray branch, be sure to do it just after the shrub finishes flowering and before it sets flower buds for the following growing season. This applies to all blooming trees and shrubs. Prune them after they flower; otherwise, you will be pruning branches containing the next season’s flower buds. 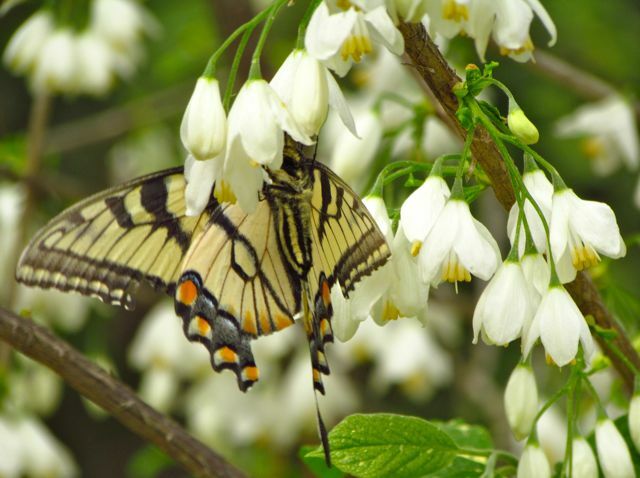 The above questions/guidelines apply to blooming perennials, other shrubs, and also trees. By the way, fertilizing these plants can often create more problems. If you site your plants correctly, mulch them with an organic, weed-free mulch, and keep them adequately watered, they will thrive without additional nutrients. The staff at the NC Botanical Garden in Chapel Hill, NC never fertilize any of their gorgeous plantings. Fresh organic mulch is applied annually, and they add water during droughts. That’s it; that’s all happy natives need. 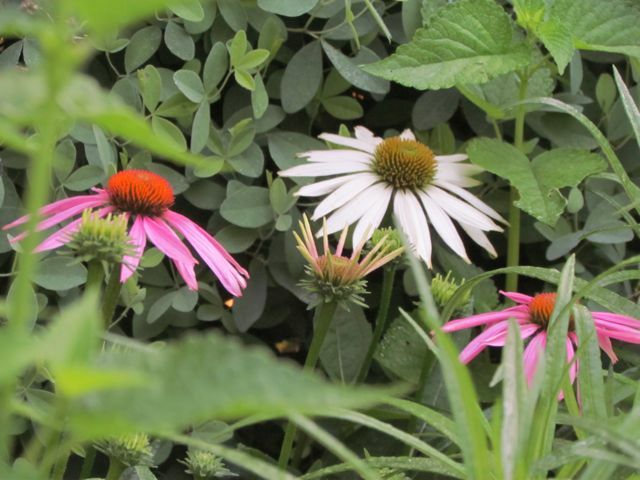 These lovely perennial coneflowers have never been fertilized in my garden, but they bloom profusely every year — and multiply their numbers! The only plants I fertilize in my yard are the few annual flowers I plant along my front walk, and my vegetables. These short-lived plants appreciate the extra boost fertilizer offers. Before I realized my native plantings didn’t need the help, I noticed that the fertilized plants in my yard were preferentially devoured by deer — one more reason to eschew fertilizers, even the organic ones. The next time you expect a plant to flower and it doesn’t deliver, run down the above checklist to be sure you’ve met all its requirements. If you have, all I can counsel is patience. Gardening patience yields beautiful results like this!